Every time Suzanna Darcy-Henneman sits down in the first seat of a Boeing airplane, she looks out the window and considers herself fortunate to be getting paid for doing what she loves most in life. Darcy, now the lead test pilot on the 777 program, has had this feeling for the past 19 years. Darcy joined Boeing in 1974 and spent her first seven years in engineering. She became a trainer for airline pilots, and in 1985 was named a Boeing Production Test pilot, becoming the first woman hired in this capacity at Boeing. 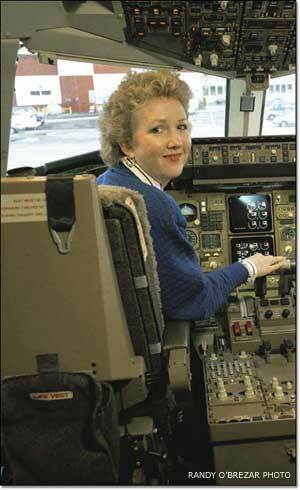 In 1989 she became the first woman rated as a captain on the 747-400 and on the 737, 757 and 767. Darcy's latest accomplishment was the completion of testing of the second of two airplanes in the 777-300ER (extended range) flight test program. As the lead pilot, she spent 537 flight hours testing overall engine performance in different environments and under a variety of conditions. But that wasn't her first flight test program. Darcy was the lead pilot on the final 777-200 airplane to enter flight test. In 1996, she conducted extended twin-operations testing on the 777 throughout Asia. "I'm never apprehensive to be the first person to fly a new airplane off the production line [during pre-delivery flight tests of new 777s], because I'm totally confident that everyone at Boeing has done their job," Darcy said. "We have the best people in the world putting our airplanes together, and our crews have extensive training." What makes an exceptional test pilot? Along with being inquisitive and analytical, Darcy said communication skills are at the top of the list and critical on test flights, especially when working with various crews, airports and air traffic control facilities. "As lead on a test flight, I rely on the crew to communicate problems to me," she said. "I try to create an atmosphere that promotes easy communication with the group." In Darcy's opinion, the greatest thing about being part of the world of aviation is that it knows no cultural boundaries. "We are readily accepted anywhere in the world," she said. "The love of aviation makes differences fall away."